It’s not that I am caught up on CD reviews. Far from it. But sometimes I have to stop and listen to something no one sent me. Something I picked up on my own. 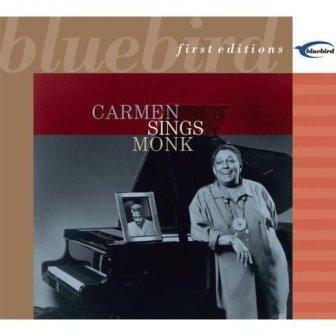 Last week, I came across a reference to Carmen McRae’s Carmen Sings Monk, and ordered it. One of the greatest jazz interpreters of all time singing one of the greatest jazz composers of all time? Recorded in 1988 and released shortly thereafter, some consider this to be the icing on Carmen’s career cake, coming shortly before her retirement in 1991 and only a few years before her death in 1994. Carmen Sings Monk – a “first edition” re-release (2001) on Bluebird--now ranks as one of my favorite vocal jazz recordings. Monk has long appealed to me as a genius of instrumental composition. If his usually quirky tunes don’t sound like musical laughter, then they surely elicit grins and giggles from the listener, as much for their startling rhythmic change-ups as for their harmonic rule-breaking. And the blues is ever-present, from “Round Midnight” to “Rhythm-a-ning.” While vocalists have long been attracted to "Round Midnight," much of the remainder of Monk’s discography has remained untouched by lyricists and singers. McRae, however, found Monk’s music a perfect fit to her own approach. Stuart Troup noted in the 1988 liner note that “Like Thelonious Monk, Carmen McRae is an uncanny original; she has the sense of adventure required to invigorate his music and the savvy to deliver it unimpaired.” The music is also invigorated by the sharp-witted lyrics of Sally Swisher, Mike Ferro, Abbey Lincoln, Bernie Hanighen, and particularly Jon Hendricks, who wrote words to seven of the thirteen tunes covered here. There are 18 tracks, with 3 previously unreleased alternate takes and two tunes presented in both studio and live versions. Most of these tunes have new titles—because most of these works have been performed endlessly as instrumentals, publishers generally insisted that adding words required a new title. Thus “Ruby My Dear” becomes “Dear Ruby,” “Blue Monk” becomes “Monkey’s the Blues,” and “I Mean You” becomes “You Know Who.” And just listening to the lyrics you generally know who, too. Beyond the usual Bernie Hanighen lyrics that enlighten “Round Midnight,” Carmen goes further, adding additional lyrics to the second chorus from Jon Hendricks and an intro and coda first added by Dizzy Gillespie. Add to all some of the best instrumental backing of the day – Charlie Rouse and Clifford Jordan on saxophone, Larry Willis and Peter Gunnison on piano, George Mraz on bass, and Al Foster on drums. Carmen McRae had a way with infusing the blues into the crevices of her musical stories, and Monk provided the perfect foundation for her to “sail phrases like perfectly aimed paper airplanes--or with a swift slingshot—so that they seem meant to have been sung her way,” wrote Linda Dahl in the intro to the new edition. I’ve listened to lots of Monk, from his original recordings to interpretations from the likes of Fred Hersch, Lynne Arriale, Vijay Iyer and more. Carmen McRae sings Monk, but it’s more like a suite of horn solos. The addition of lyrics—these lyrics-- augments the spirit of the underlying notes and phrases, and Carmen further transforms it all, keeping it within the world of Monk while building bridges to make that world more accessible. And maybe now, when I hear a Monk tune, I will more readily recognize not only the composer but the tune itself—I now have words, and stories, to connect the musical dots.